“Paul Edgecomb: On the day of my judgment, when I stand before God, and He asks me why did I kill one of his true miracles, what am I gonna say? That it was my job? My job? “John Coffey: You tell God the Father it was a kindness you done. I know you hurtin’ and worryin’, I can feel it on you, but you oughta quit on it now. Because I want it over and done. I do. I’m tired, boss. Tired of bein’ on the road, lonely as a sparrow in the rain. Tired of not ever having me a buddy to be with, or tell me where we’s coming from or going to, or why. 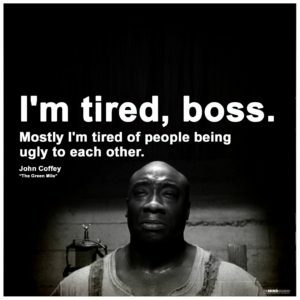 Mostly I’m tired of people being ugly to each other. I’m tired of all the pain I feel and hear in the world everyday. There’s too much of it. It’s like pieces of glass in my head all the time. Can you understand? If you haven’t seen The Green Mile (adapted from the Stephen King novel of the same name), take the time to do so. That sense of pieces of glass in our heads is a prescient echo of the discord we’re living with today. And the questionable redemption and complex morality depicted are worth reflecting on again as well. It actually started because I was interviewed for the USA Today Happy Ever After blog, which was featuring authors of lesbian scifi. When it first went live, I had another squee-worthy moment of again sharing the same atmosphere as Gail Carriger. (If you remember back to my release day announcement, we were both on the hot new releases in LGBT Scifi on the Amazon genre best-sellers list then. Funnily enough, the book that boosted her to number one in that category was the one she was talking about for her portion of this interview feature, too, Romancing the Inventor.) Thus I discovered Born Out of Wedlock, by Lyn Gardner. In some ways it’s your classic love story between a billionaire and a pauper, in others, it takes all those tropes and dumps them on their head. And it’s an F/F love story. Some of the things my editor for The Builders pointed out to me about F/F love stories were beautifully limned in this tale–how carefully the relationship is built up, not only between the two protagonists, but also among all the main characters. The stakes are high, but the relationships are real, so the payoff for the reader is well worth the wait. I’m not generally greatly enthusiastic about contemporary romances, but this one hooked me. In other news, Natasha started rejecting her pain meds yesterday. (And, seriously, how does a dog simply “un-swallow” ONE, small pill?) She’s so much happier not being doped up, and her gait has definitely improved. So maybe all the therapies we’ve thrown at her are finally allowing her to heal from her various injuries. We’re still taking it easy on the walks, so even though the weather has been unseasonably beautiful, my step count dropped back down to an average of 2,322 this week. I’ve also renegotiated my deadline with my editor and added a few more words to my WIP, despite only barely waking up from my overwork fog this weekend, to the tune of 566 new words. A slow-but-steady approach should get me to my new deadline without too much stress. I hope. In the meantime, I’m back to cheering on my ROW80 mates, and will return again next week to report on my progress.